From its inception, GAA made the decision to work with all stakeholders to bring the ethos of responsible aquaculture development to as many producers as possible. To do this, we created Best Aquaculture Practices (BAP) facility certification standards that are rigorous and comprehensive. And we have created a system to certify compliance using independent, experienced and fully credentialed ISO 65-accredited certification bodies. BAP certification defines the most important elements of responsible aquaculture and provides quantitative guidelines by which to evaluate adherence to those practices for processing plants, farms, hatcheries and feed mills. 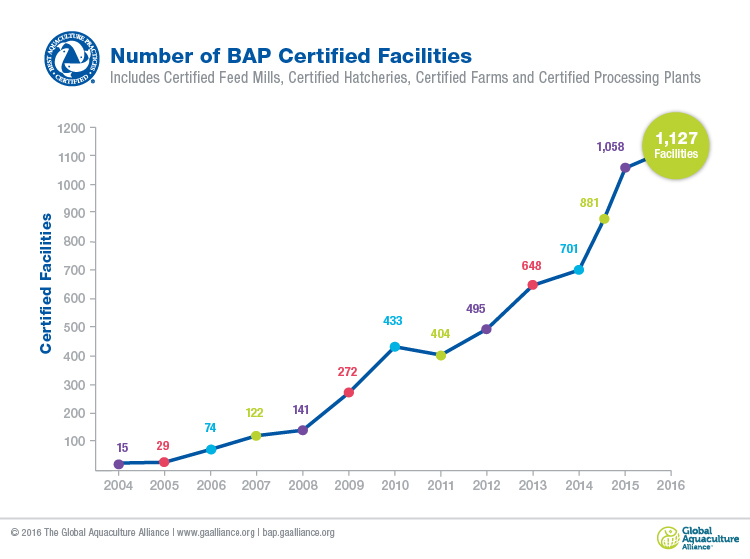 The number of BAP-certified facilities worldwide grows daily. To learn more about the BAP certification process and standards or to search BAP-certified facilities visit bap.gaalliance.org.